If you’re willing to fork out big euros for a 4 star or 5 star room with a view then there’s no better place than Amalfi Coast hotels. 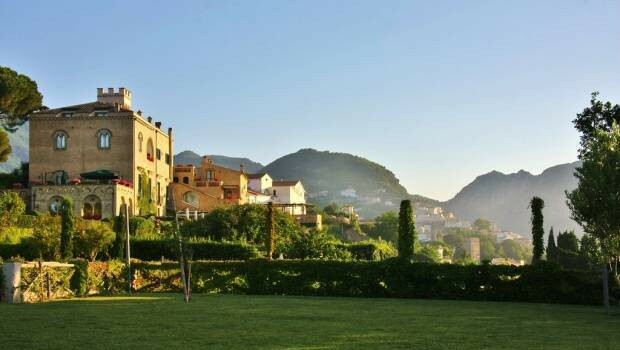 For those searching for that special combination of history, lavishness and superior service, three Ravello hotels in particular deliver the wow factor. After taking the fifteen minute bus ride to Ravello from Amalfi and then a short walk to the left of Piazza Vescovado, you reach Hotel Rufolo, a 4 star historical hotel with a commanding view of the sea. I stayed in a room on the first floor overlooking the Villa Rufolo gardens but the hotel has five levels, and the upper rooms, especially the junior suites, are exceptional. They are long rectangular rooms with breath-taking views and a whirlpool tub in the bathroom. 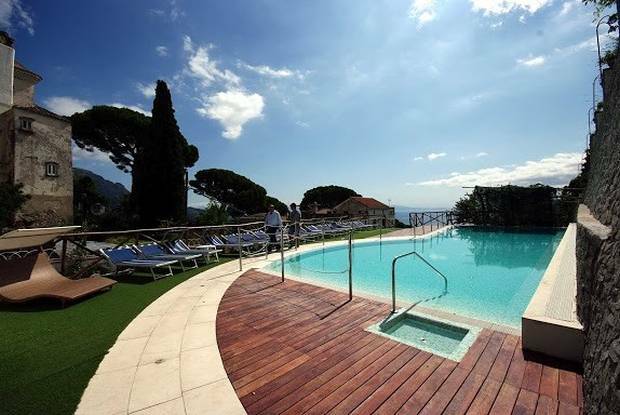 The swimming pool, terrace and top-floor restaurant also offer commanding views. Not all the rooms have sea views but five offer small terraces and connecting rooms are available for families. Rates range from €250 per night for a superior double room, to €550 per night for a junior suite in the high season. For more information visit www.hotelrufolo.it. 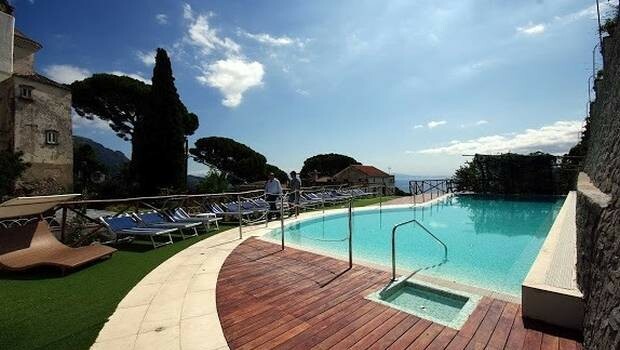 Five star Villa Cimbrone is about a ten minute walk from Hotel Rufolo. Luckily they do have a baggage transporter for your luggage otherwise it would be a bit of a struggle as the path is narrow and has frequent steps. 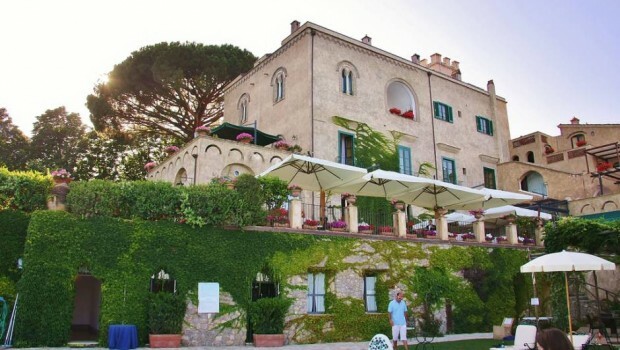 More on the pricey side with suites at €1,000 per night at the high end, and €400 at the low end, staying at Villa Cimbrone is a true step back in time to a bygone era. Situated on top of a cliff with a pool and lavish gardens formally landscaped by Lord Grimthorpe, Niccolo Mansi and Vita Sackville West, it is a tranquil oasis of peace. Villa Cimbrone boasts one of the best views in Ravello from the Terrace of Infinity and there are a myriad of pathways to explore. I discovered a gelato shop with its own private balcony beneath the Terrace of Infinity, which sells delicious lemon granita. Unfortunately I didn’t stay at Villa Cimbrone as it was slightly out of my budget but I did get a personal tour by the receptionist, and was shown the library, the reading room and one of the Junior Suites which was €700 a night. All I can say is that it was superb and now makes me want to stay there even more! For more information visit www.villacimbrone.com. 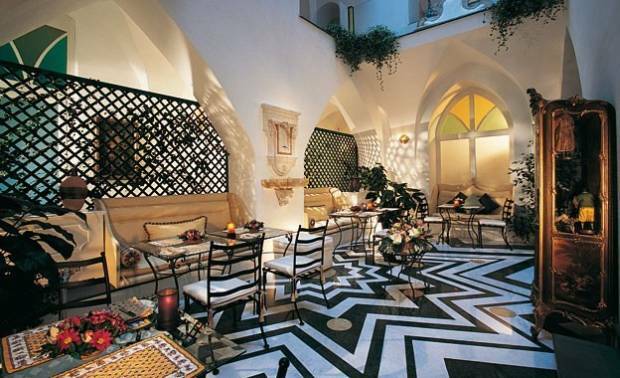 It may be a while before I manage to afford staying at 5 star Palazzo Avino as well. 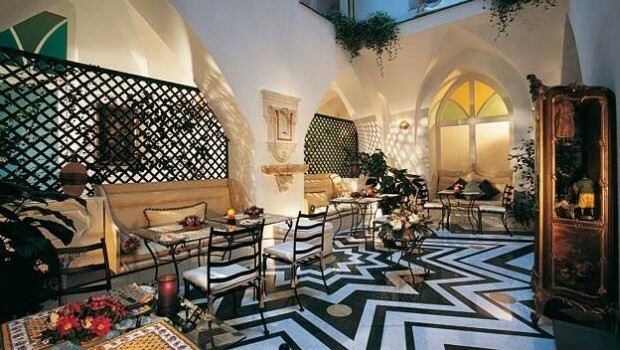 This is a 12th century villa which has been renovated to the cost of $20 million. Guests are personally escorted by hotel staff when they arrive in the town centre. The view from the roof is apparently spectacular, and has two Jacuzzis. All rooms have sparkling white tile bathrooms with gold fixtures. The food presentation and service are also impeccable, and almost too perfect so I’ve read. Rates in the high season range from €320 per night for a double room with no view, to €2,300 per night for the Suite Infinito with a sea view. 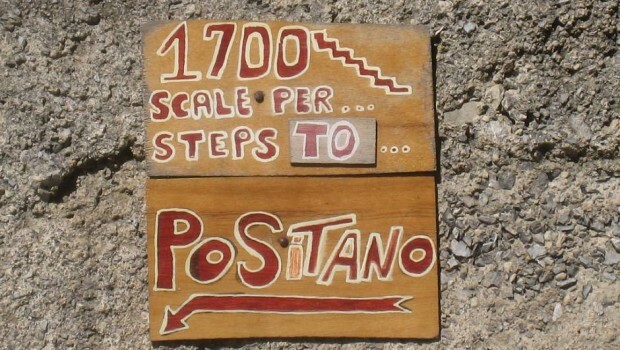 For more information visit www.palazzoavino.com.